The black corners are normal on the canon powershots. In order to reduce production cost, they try to use the smallest lens possible, and find rely on software correction and in camera cropping. For the jpegs, a 12 megapixel image may actually be like 11.8 megapixels or less, and then the camera corrects for as much distortion as it can, then crops, then interpolates back to 12 megapixels. when you apply the lens correction, you end up correcting as much distortion as possible, then cropping out the uncorrectable areas. I apologize if generated confusion with my "teory" about asymmetrical black corners in raw and lens barrel misalignement. My thoughts were based on empiric tests on my ixus where i saw that gently pushing the lens barrel reduces vignetting on the opposite corner to pressure (and grows it on the same side). BTW i never told to kick the lens and underlined the word "gently" in my previous reply. Below 2 raw samples from my ixus 125 @ 24 mm with and without a small pressure on top right corner. That's true towards the wide end of the zoom range. The correction and black corners gradually go away when zooming in, and the whole sensor area is used to create the JPEG. BTW, this is not Canon specific, most (if not all) other manufacturers do the same. Pre-DIGIC4 Canon cameras did not use this trick. Thanks for your quick anwswers guys! Here is a sample of a RAW picture with the FULL crop size. The lens and the sensor are solidary. If there is a misalignement, it is from factory. The pressure that you apply only create tensions that moves a little the lens assembly, but didn't correct so-called misalignement. 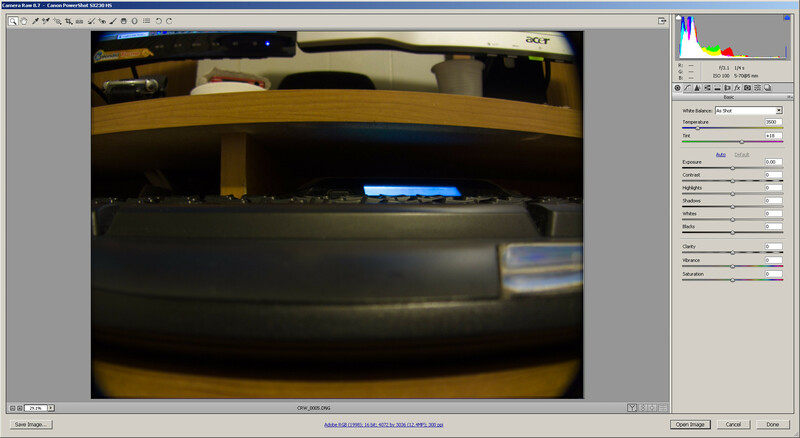 And there is the risk to really misalign lens-sensor assembly and get out-of-focus zones in the photos. Here is a good example of the corners of an image when the lens is too small for the sensor. Lens designed for a crop sensor, being placed on a full frame camera. Even at the widest end of the lens, on an actual crop sensor camera, the actual imaging area will be nowhere near those corners. Anyway, for your camera, you will have to take a picture of a grid with the camera as perfectly aligned as possible (tripod recommended). After that, head over to adobe camera raw, then start doing some manual lens correction to get all of the lines as straight as possible while retaining as much image data as possible. You can then save that as a preset that you can simply apply when you open a raw image, before doing your other edits. Thanks. Based on this image the DNG active area in CHDK is fine.